Unprecedented numbers of skilled workers are retiring while energy companies find themselves in a turbulent marketplace. Utility companies face market disruption from distributed energy resources (DER), and oil and gas companies must cope with oil prices at near-historic lows. The pressures to cut costs are greater than ever, while worker safety and productivity remain a high ...priority. 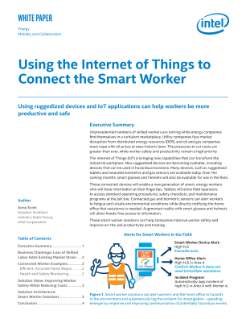 The Internet of Things (IoT) is bringing new capabilities that can transform the industrial workplace. New ruggedized devices are becoming available, including devices that can be used in hazardous locations. Many devices, such as ruggedized tablets and wearable biometric and gas sensors are available today. Over the coming months, smart glasses and helmets will also be available for use in the field. These connected devices will enable a new generation of smart, energy workers who will have information at their fingertips. Tablets will allow field operators to access standard operating procedures, safety checklists, and maintenance programs at the job site. Connected gas and biometric sensors can alert workers to fatigue and unsafe environmental conditions while directly notifying the home office that assistance is needed. Augmented reality with smart glasses and helmets will allow hands-free access to information. These smart worker solutions can help companies improve worker safety and improve on-the-job productivity and training.